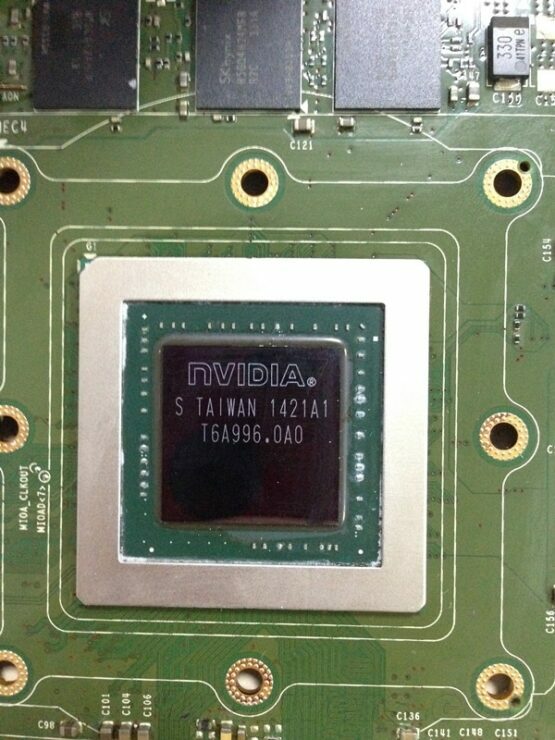 Our chinese friends over at Mydrivers have just unveiled pictures of the Maxwell flagship Geforce GTX 880. The pictures clearly show the die which has been manufactured by TSMC, and not only that it shows the TDP as well as other minute details. 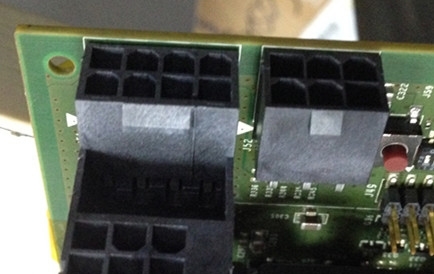 So enjoy this very significant (and the first real leak) of the possible GTX 880 Maxwell Flagship. Alright first thing is first. You can clearly see 8 Hynix memory chips on the picture so we are looking at 8GB of vram and possibly 16GB of vram for professional counterparts. The code 1421A1 can be seen clearly which means that its i s the A1 revision of the die which was manufactured in the first 21 weeks of 2014, which means May 19-25. Basically you are looking at a completely fresh die that has been rolled from TSMC (notice the word Taiwan? that means it is TSMC). We can also see 1 Eight Pin and 2 Six Pin Connectors which amounts to a grand total of of 375W (PCI-e: 75W, 2x6Pin: 75Wx2 and 8 Pin: 150W). Actually 2 Eight pin power connectors can achieve the same load but this is done to increase stability and take of most of the load from the PCI-E. So we could see TDP of around 300-375W. The memory code is SKHynix H5GQ4H24MFR so we are looking at a memory configuration of upto 16GB on professional Quadro counterparts (which this card could very possibly be). Ofcourse this could be the GM204 core for all we know but the most interesting thing I find is that a very big portion of the GPU is actually pixelated out. So we are hiding something that not even NDA breakers dare reveal. What could that possible be? Well an obvious guess would be an ARM core and that seems likely because when we saw the Darbee variants the ASIC was placed in approximately the same PCB space. The card is completely barebones and reeks of being freshly baked. 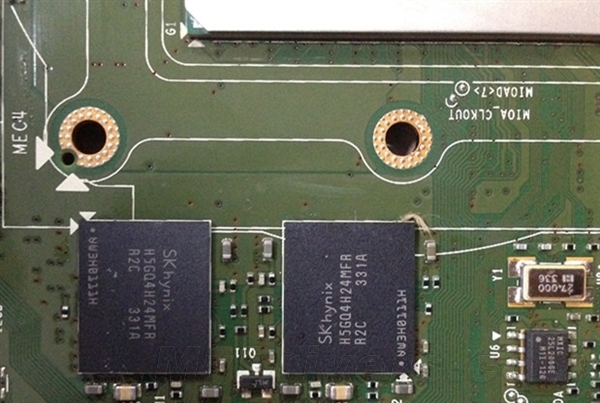 Also the PCB appears to be freshly made as well, since I can still see the residue of the printing on the top connectors. Also it goes without saying that the core could very easily be GM204 since I am primarily quoting mydrivers when I say its a GM210. We cannot be sure whether this core is based on the 28nm fab with an ARM core (in which case it would be second generation) or the 20nm fab (in which case technically it would be third generation). Although realistically speaking we are most probably looking at the 28nm node with an ARM core. Now though it is technically possible to compare die sizes by comparing pictures, I don’t want to go into it because that would mean changing the perspective slightly of the die shot which could result in erroneous results. 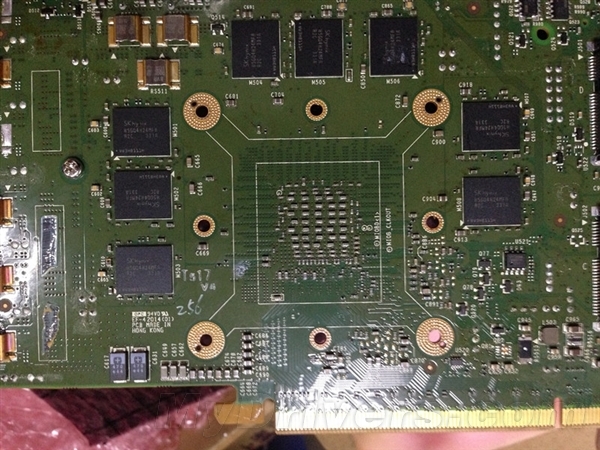 Also this appears to be a very early prototype which is obvious from the green PCB, and since we learned that nvidia has recently shipped the loadboard for the GM2xx circuits this is going to be the testing playtoy of Nvidia engineers. Needless to say, we are going to be hearing about the Geforce GTX 880 Maxwell flagship (or the Quadro variant) very soon.